Malignant hyperthermia (MH) is a hypermetabolic disorder of skeletal muscle that is triggered in susceptible individuals by several inhalation anesthetic agents (sevoflurane, desflurane, isoflurane, halothane, enflurane, and methoxyflurane) and succinylcholine. These anesthetic triggers cause intracellular hypercalcemia in skeletal muscle by decreasing the uptake of calcium by the sarcoplasmic reticulum. The intracellular hypercalcemia activates metabolic pathways that result in adenosine triphosphate (ATP) depletion, acidosis, membrane destruction, and ultimately cell death. Susceptibility to Malignant hyperthermia is inherited as an autosomal dominant disorder and most susceptible individuals are completely asymptomatic until exposed to triggering agents. Episodes of Malignant hyperthermia occur most often, but not exclusively, in children. The mean age for Malignant hyperthermia is 15 years, although cases have been reported in infants as well as the elderly. The Malignant hyperthermia incidence ranges from approximately 1 in 10,000 to 1 in 50,000 individuals who are exposed to the triggering agents. In most cases, the first signs and symptoms of the disorder are evident in the operating room. However, Malignant hyperthermia can also occur in the recovery room or even after the patient has been transferred to the patient floor. It is important to remember that none of the signs and symptoms occur in all cases. Initial signs usually include tachycardia (90% of cases) and tachypnea (80% of cases) due to the sympathetic nervous system response to the underlying hypermetabolism and hypercarbia (80% of cases). In the paralyzed patient under general anesthesia, the first sign of Malignant hyperthermia can be hypercarbia that is resistant to adjustments in the ventilator setting. Next, an increase in blood pressure, cardiac dysrhythmias, and muscle rigidity (80% of cases) are often seen. Patients may then become hyperthermic (70% of cases), with a rise of 1 to 2 degrees Celsius every 5 minutes. An arterial blood gas will usually show respiratory and metabolic acidosis. Other lab abnormalities include hyperkalemia, hypercalcemia, lactic acidemia and myoglobinuria. Creatinine kinase levels rise to 20,000 or more within 12 to 24 hours, putting the patient at risk for myoglobinuric renal failure. Isolated myoglobinuria in the early postoperative period should make the anesthesiologist and surgical team suspicious for Malignant hyperthermia. Masseter muscle rigidity shortly after the administration of succinylcholine has also been associated with MH as well. Malignant hyperthermia treatment is simple. With early diagnosis and appropriate treatment, the mortality rate approaches zero. If Malignant hyperthermia is suspected, all triggering agents should be discontinued immediately. In the operating room, the patient should be ventilated with 100% oxygen at a flow of 10 L/minute. 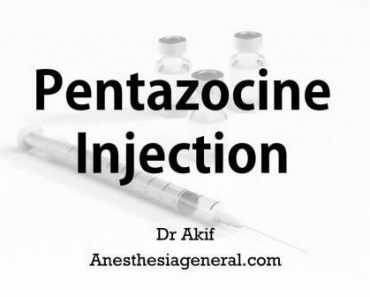 If a general anesthetic must be continued, it is safe to administer barbiturates, benzodiazepines, opioids, and propofol. The patient should be intubated as soon as possible. Cardiac dysrhythmias, hyperkalemia, acidosis, and other medical problems should be managed appropriately. The patient should be given dantrolene as soon as possible. Dantrolene acts by inhibiting the release of calcium from the sarcoplasmic reticulum. The initial dose is a 2.5mg/kg intravenous (IV) bolus followed by 1 mg/kg IV every 6 hours for at least 24 hours. Dantrolene’s side effects include nausea, phlebitis, and weakness for approximately 24 hours after the drug is discontinued. Each vial of dantrolene contains 20 mg of dantrolene and 3 mg of mannitol and must be mixed with 60 mL of sterile water. The initial dose for a 70-kg adult is 175 mg or 9 vials. Assistance should be sought in mixing the dantrolene as it is poorly soluble. Dantrolene 2.5 mg/kg should be given every 5 to 10 minutes until there is a fall in heart rate, normal cardiac rhythm, a reduction in muscle tone, and a decline in body temperature. Maintenance of normal volume status is essential in the setting of rhabdomyolysis. Hyperkalemia may require treatment with insulin and glucose. Caution should be excercised with potassium-losing diuretics as hypovolemia should be avoided. Furthermore, administration of calcium should be avoided unless there is symptomatic hypocalcemia because of the expected hypercalcemia during the recovery phases of rhabdomyolysis. Dysrhythmias can be treated with beta-blockers and lidocaine. Calcium channel blockers should be avoided. The patient’s temperature should be managed with ice packs, cold IV fluids, and cold water down the nasogastric tube. Patients should recover in the intensive care unit (ICU) to receive monitoring of arterial blood gas, electrolytes, creatinine kinase, myoglobin, and lactate levels. Patients should also be monitored for a recrudescence of Malignant hyperthermia that can occur within hours of the initial episode, as well as disseminated intravascular coagulation (DIC) and myoglobinuric renal failure, for which the patients should receive ample volume replacement. The Malignant Hyperthermia Association of the United States (MHAUS) is a nonprofit organization that was created to educate the public, to counsel Malignant hyperthermia patients and their relatives about their condition, and to educate anesthesia and operating room personnel about the management of Malignant hyperthermia. Ahotline is available to advise clinicians in the acute management of Malignant hyperthermia. Additional educational materials can be obtained by calling the hotline number, 1-800-MHHYPER (1-800-644-9737).